viaLibri ~ The Complete Tales, Vols 1-8. The Complete Tales, Vols 1-8. London: Rupert Hart-Davis. Very Good+ in Very Good- dust jacket. 1962-3. Hardback. Please note that this is a heavy item and will require extra postage. 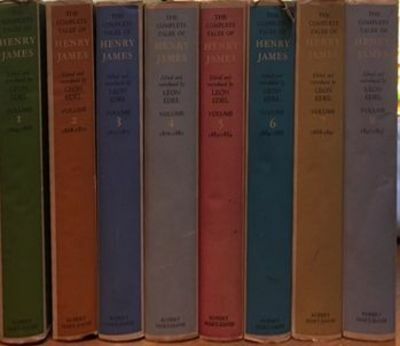 ; All Vols: Plain d/jkt, unclipped, various colours; lightly marked. Spines a little faded; occasional offsetting on front panel; occasional very light wear to head of spine and top edges. Light grey boards, clean; gilt titling on red panel at head of spine still bright; binding tight. Owner's name on front endpaper of Vols 1-4. This set covers the years 1864-1892. ; 8vo (5" x 8"); 430+446+401+522+414+444+462+504 pages .